South Cross Shaft, South view. South Cross Shaft, South view. 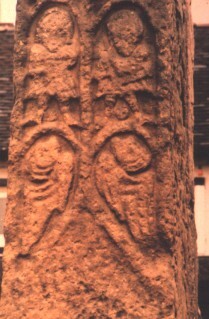 The cross is dated to the mid ninth century. This is the lower part of the cross shaft. There are two angels at the bottom of the shaft. Above the angels there are two men, possibly Peter and Paul.